A student who combined her love of musical theatre with her passion for graphic design and photography has seen her work published in the national press. Wrexham Glyndŵr University student Charley Wiles, who is studying Graphic Design and Multimedia, has always had a passion for the theatre. 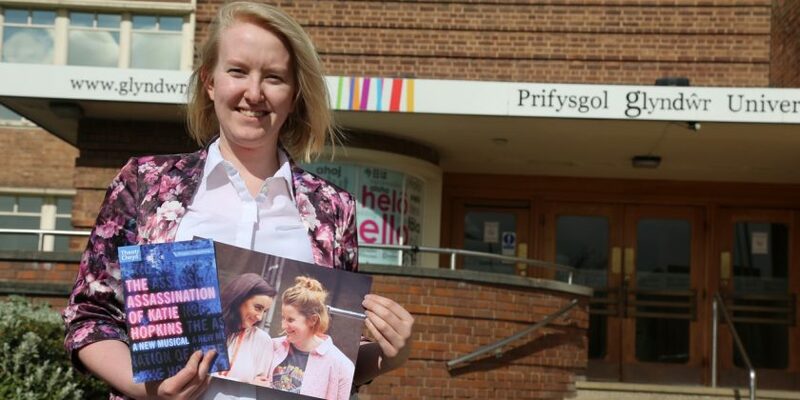 Working alongside the Careers team at the university, she secured a placement at Theatr Clwyd in Mold – where her work so impressed staff that they asked her back to take pictures for a forthcoming production. That production, a musical entitled The Assassination of Katie Hopkins, grabbed headlines across the globe – and Charley’s work has now been seen by thousands. “I have been interested in theatre for most of my life – with acting, singing and all that jazz,” explained Charley, from Mostyn. “I remember being onstage in front of thousands at the National Eisteddfod in 2007. “I met Tamara Harvey, Theatr Clwyd’s artistic director, when she came here to take part in the Creative Futures conference last year. I spoke to her about working with her then. The programme itself is designed to support the employability of young students on higher education courses in Wales. Aimed at young students who have faced barriers in accessing higher education or work experience, and potentially could experience barriers to securing suitable employment when they graduate, it offers a variety of options where students can gain between three days and six weeks of work experience. Charley explained: “I did a placement with Theatr Clwyd last year. During that time, I did their panto shots for the programme at Christmas. “They liked those, and they asked me back to take some more when they started pulling together the musical. It’s been fascinating work – it’s a very technical set and stage design. The musical is controversial, although I think when people actually see it, it won’t be what they expect. Pauline Amphlett, senior lecturer in graphic design at Wrexham Glyndwr University, said: “It has been marvellous to see Charley’s work in national newspapers. “She has a real talent – and by working with Gill, and taking advantage of opportunities like our Creative Futures conference, an annual event organised by Careers Advisor Neil Pritchard, she’s getting her work out there and getting it seen. Gill Hewitt added: “Charley has had musical theatre in her life so this has been great for her – she is a very, very active young lady who wants to go all the way, and helping secure work experience like this helps. More on Wrexham Glyndŵr University’s BA Hons and M (Des) in Graphic Design, can be found here. To find out more about your work experience options when studying at Wrexham Glyndŵr University, click here.